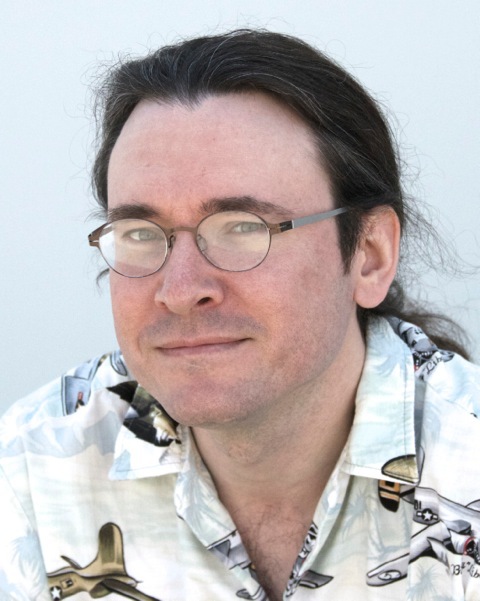 This week on the NPR radio show Science Friday, our co-founder, Windell Oskay, will be talking with Ira Flatow about Halloween hacks and projects and will likely be taking calls from listeners. Find out how to listen online and what radio stations will be broadcasting in your area. The show airs live from 2-4 p.m. Eastern Time (11 a.m. to 1 p.m. Pacific) and Windell should be on around 3:30 p.m. Eastern (12:30 p.m. Pacific). 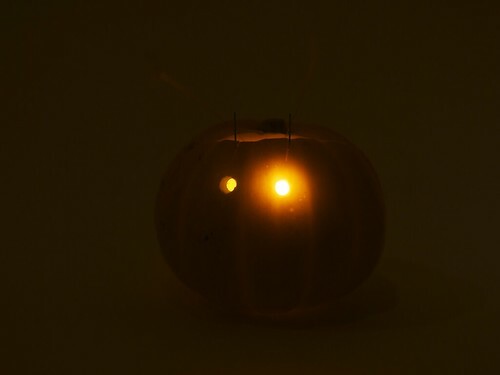 Our archive of Halloween projects and hacks can be found here. 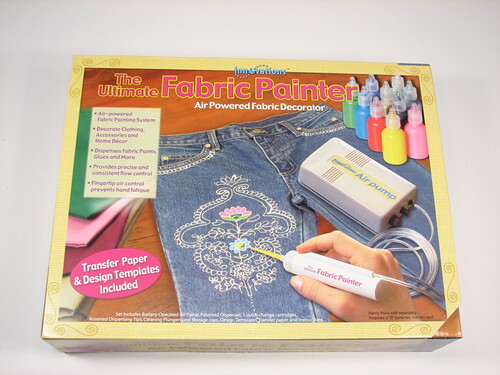 This entry was posted in General News, Science and tagged hacks, holiday, science friday. Bookmark the Permalink. We recently came across this instructable by rleyland on hacking our ISP Shield for Arduino for use with ATtiny45 and ATtiny85 microcontrollers. These are occasionally handy little AVRs, and we’ve previously written about using our ATtiny2313 target boards for the ATtiny25/45/85 family here. This entry was posted in Electronics, EMSL Projects and tagged hacks, ISP shield. Bookmark the Permalink. Hobby servo motors are the little wonders that make radio-control boats, airplanes, cars, hovercrafts, helicopters, submarines and robots work. And they are excellent devices for hacking. Hobby servo motors each contain a little motor, which (through a set of gears) turns the output shaft, which is connected to a potentiometer, which provides position feedback to the controller chip inside the servo, which commands the motor to move until the output shaft reaches the desired position. We’ve seen all kinds of crazy and wonderful servo modding– from the standard continuous rotation mod to the simple electronic speed controller, to full-on (servo) brain transplants. We are now pleased to report that this project has just been released to the public over at Make Projects, where they have released a step-by-step version of the magazine article. 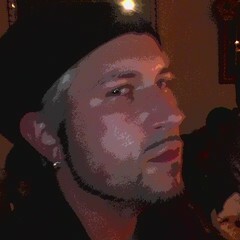 (So go take a look!) One note: be sure to download the two PDF documents listed under “Files” — you’ll need those diagrams to follow along with the project. 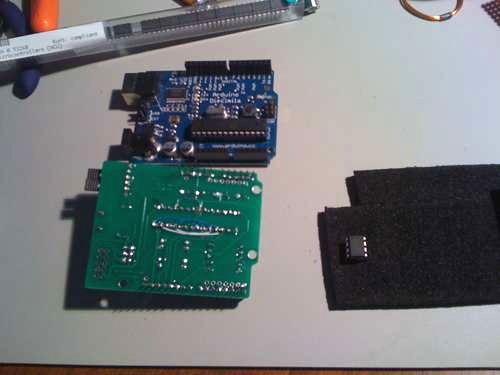 This entry was posted in EMSL Projects and tagged diy, hacks, make. Bookmark the Permalink. 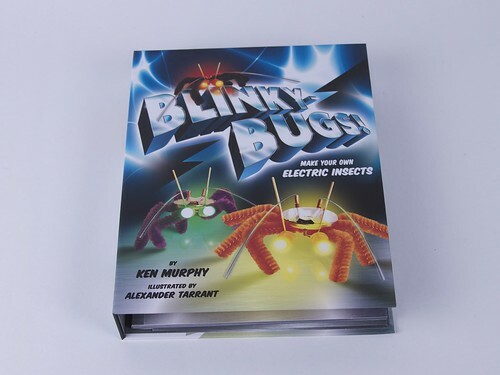 Our good friend Ken Murphy recently published his wonderful Blinky Bugs as a book and kit and was awesome enough to send us a copy. 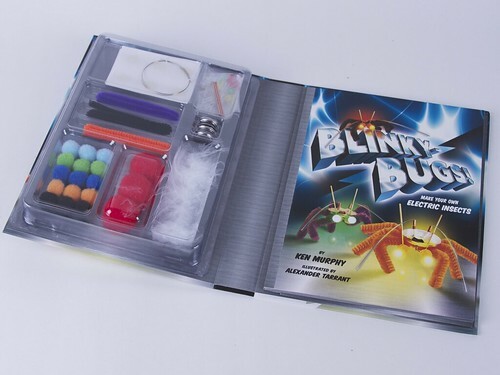 Blinky Bugs are easy to make LED critters with antennae as blinker switches that activate in response to vibration or air movement. Chronicle did a very nice job with it–the book itself comes out of the nifty sleeve that holds the kit and book together. The cartoon illustrations by Alexander Tarrant are very clear and there’s a nice assortment of accessories to go with the core hardware. The bug circuit went together very easily. These little guys are super compact and self contained, which means they’re adaptable to all kinds of uses. And while putting them on pipe cleaner legs is seasonally appropriate, they’re a perfect fit for a mini-pumpkin. The first thing to do after gutting the gourd is to mark and cut the holes for the LED eyes. A 3/16″ bit turned by hand makes a hole that is just snug enough to hold a 5 mm LED firmly in place. 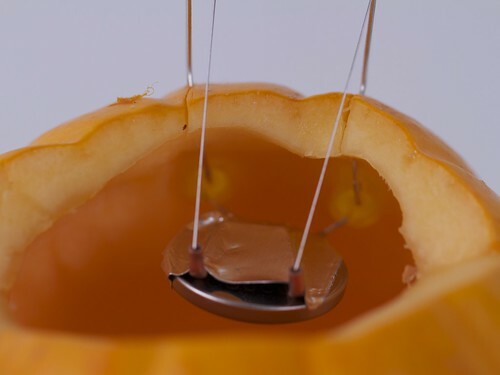 A couple of slits let the LED leads stick up through the body of the pumpkin where the antenna wires will be able to reach them. 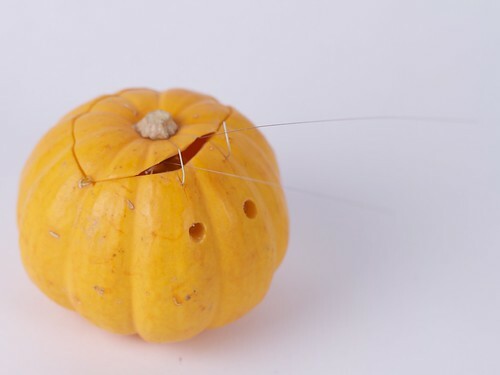 Finally, the pumpkin lid is trimmed to allow the antenna wires to move freely. 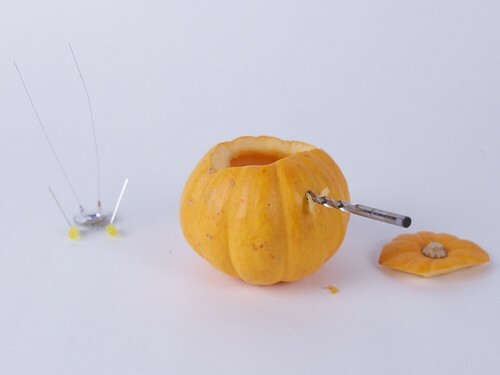 This entry was posted in Electronics, Engineering, Everything Else and tagged hacks, Halloween, pumpkins. Bookmark the Permalink. While we don’t normally find ourselves as part of the case mod community, we’ve been invited to participate in the Rods and Mods event, “The Kustom Kulture of Radical Computer Modification” currently going on, Thursday through Saturday at the Exploratorium in San Francisco. We’ll be attending this Saturday, showing off some of our recent projects and maybe even some hacked devices. You can read more about this event here, and we’ll hope to see you there! This entry was posted in Field Trips and tagged computers, exploratorium, hacks, mods, museum. Bookmark the Permalink. 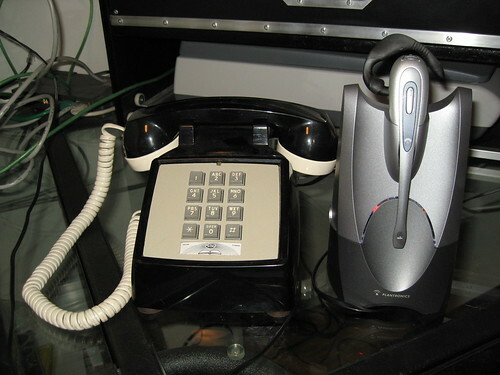 A detailed hacking how-to guide: Modify a classic 80’s desk phone for use with a modern wireless handset and build in an integrated handset lifter. [This is a guest project contributed by HiTek LoLife; all-around great guy, friend, neighbor, and reader of Evil Mad Scientist Laboratories. A small bit of his handiwork has actually made an appearance here before and his fine stock ’94 Toyota shortbed has been known to transport the CandyFab 4000 from time to time. This entry was posted in Electronics, EMSL Projects and tagged electronics, hacks. Bookmark the Permalink. We are crazy about Thanskgiving, both for being the only real food-centric American holiday and for giving us an excuse to make all kinds of things that we don’t make the rest of the year. One of the few downsides is that we usually end up eating the same leftovers for days on end afterwards. These can be amongst the best leftovers that you get, however even your favorite dish can start to wear on after having it reheated for the fourth meal in a row. The solution? Food hacking– a tasty form of recycling! Incorporate your leftovers into new recipes to bring them back to life. While reworking leftovers certainly isn’t a new process (Bubble and Squeak, anyone? ), it is one that benefits from a fresh approach from time to time. After the jump, a few of our favorite out-of-the-box approaches to eating well on Black Friday. This entry was posted in Play with your food and tagged food, hacks. Bookmark the Permalink. Fused deposition machines are an interesting class of rapid prototyping and art robots, capable of extruding paint onto a canvas or extruding to build up complex, three-dimensional objects one layer at a time. Naturally, one of the challenging parts of designing machines like these is designing and building a system for dispensing the printing medium. So, imagine how surprised we were when we were walking through the aisles of our local Michaels craft store and saw a pre-built extruder on the shelf for $20! Naturally, we picked one up because an extruder head might make a nice accessory for our own three dimensional printer. So, what is it? 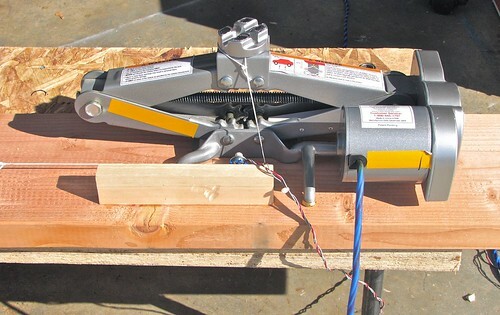 It’s an inexpensive kit that can be used for developing your 2D or 3D printer extruder with an air-powered delivery system. For the price you can get a small air pump, tubing, syringes, tips, and dispenser. The components are simple and easily hackable, and it looks like a good set of tools for starting to build a simple extruder head for an art bot of some sort. This entry was posted in Art, EMSL Projects, Play with your food and tagged food, hacks. Bookmark the Permalink. What do you get when you mix a 1970’s style analog chart recorder, an 8-bit microcontroller, and a Fisher-Price Doodle Pro? 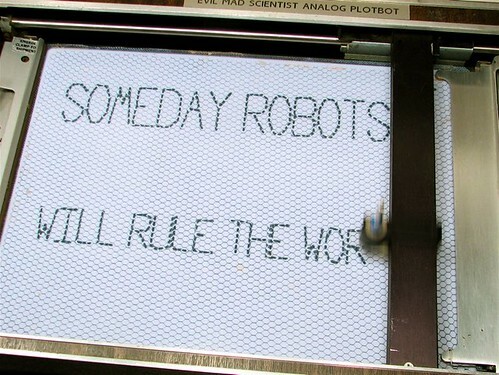 A truly 21st century toy: An analog PlotBot with e-paper display technology! 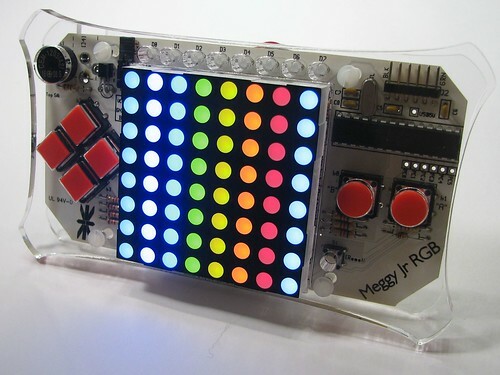 This entry was posted in Art, EMSL Projects, Microcontrollers and tagged art, AVR, hacks. Bookmark the Permalink.